Mood board: Since arriving at the label, Jason Basmajian has nurtured the idea of a tailored jacket with a sportier flair. His clothes have an intergenerational appeal. Inspiration for A/W 2019 came from a visit to the Oceania exhibition at the Royal Academy in London late last year which marked 250 years since Captain James Cook’s first voyage to the Pacific. Silhouettes were comfortable but not oversized; Basmajian talked of the urban explorer. There was a lean mien to belted suits. A new suit jacket shape was a cropped blouson in wool. 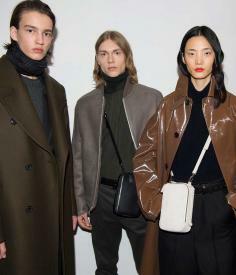 Hardy, wintery textures of leather, twill and wool were teased in myriad ways into efficient clothes. Team work: Piles of Yves Klein blue paper totems and black shrink-wrapped cubes broke up the concrete and white curve at Palais de Tokyo. The models walked as Sabina Sciubba, the Grammy Award-nominated singer of electronica band Brazillian Girls, performed an electro slouchy set.